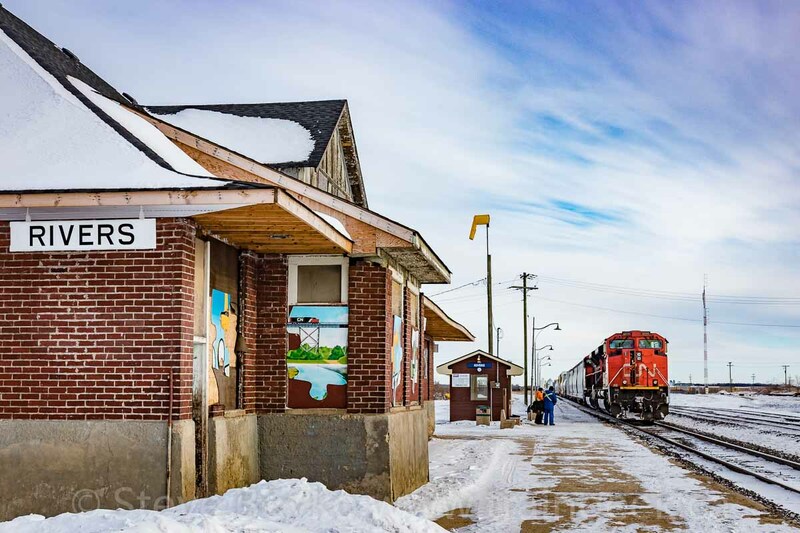 VIA Rail's Canadian has been notoriously late this winter. At times VIA 1 (westbound) or VIA 2 (eastbound) has been well over 12 hours late and sometimes more than 24 hours late. Today's VIA 1 and VIA 2 were no exception. VIA 2 was almost 24 hours late today. 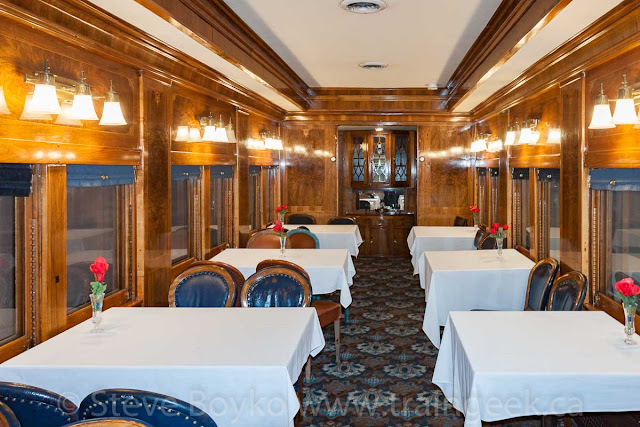 It was supposed to arrive at Union Station downtown Sunday (yesterday) at 8:45 PM and leave at 10:30 PM. 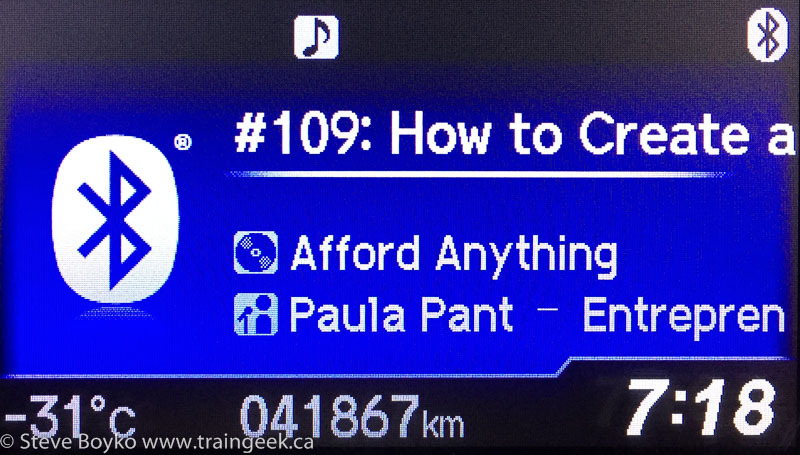 I was downtown this Monday evening and noted VIA 2 at the station at 6:30 PM. I don't know when it arrived but that was almost 24 hours late. 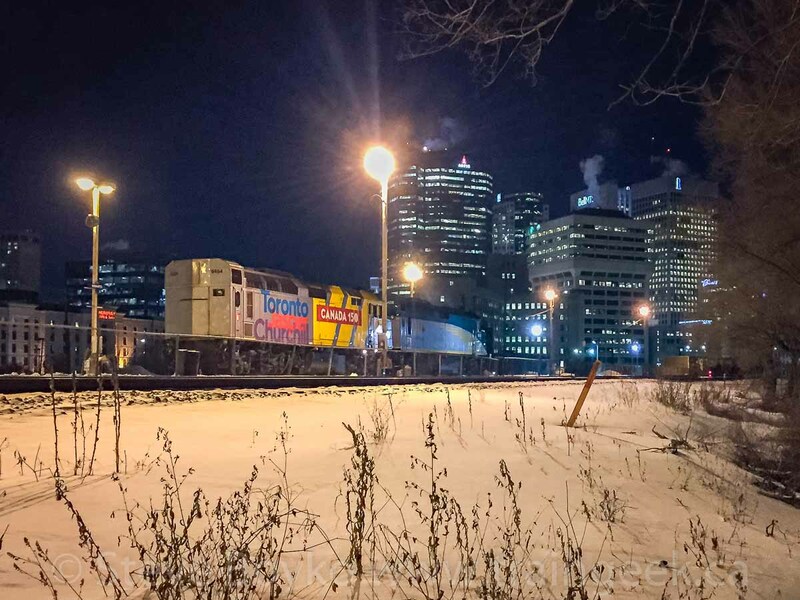 I parked at the Forks and at 6:35 PM I noted two VIA locomotives zooming east past the station toward the head end of their train. I'm not sure what they were doing but I have a theory. They were not so late earlier this morning, but they lost a lot of time. 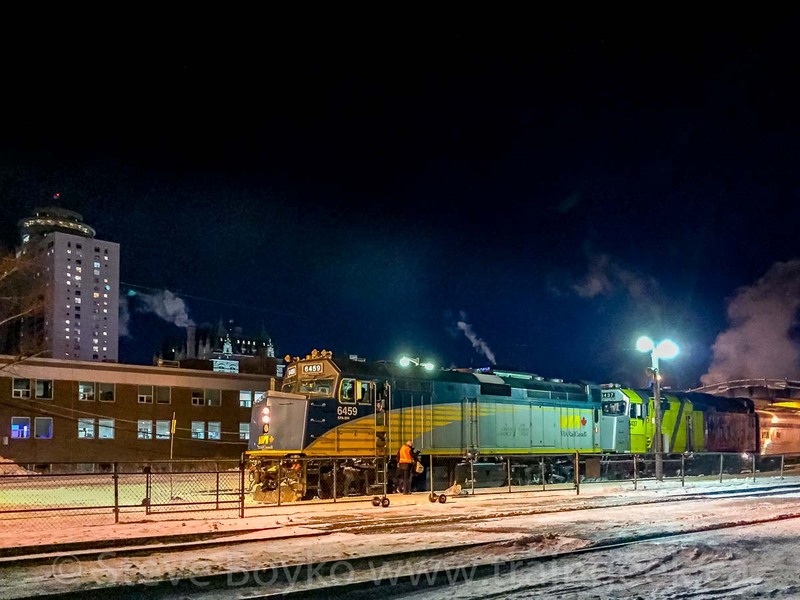 Maybe there was a problem with one or both locomotives and they had to swap them out at the Winnipeg Maintenance Centre. Regardless, VIA 6458 and 6454 ran to the switch, then reversed in toward the station. The odd thing was that they didn't immediately couple onto their train. I just had my iPhone 6 with me so that was my best camera! 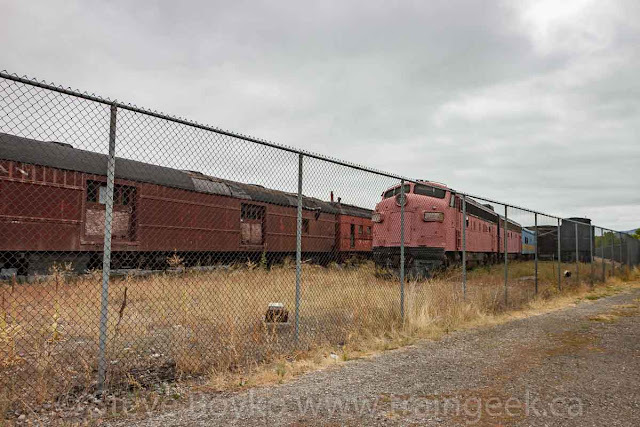 I walked around, trying to find an angle to see the two locomotives from VIA 2. The CN track is higher than the land around it so it's hard to find a spot where you aren't looking up a hill at the trains. I found a spot where I could scramble up a snow-covered hill to get close to level with the tracks. There's a fence here, so I held my phone up to the fence with the lens between the wires. 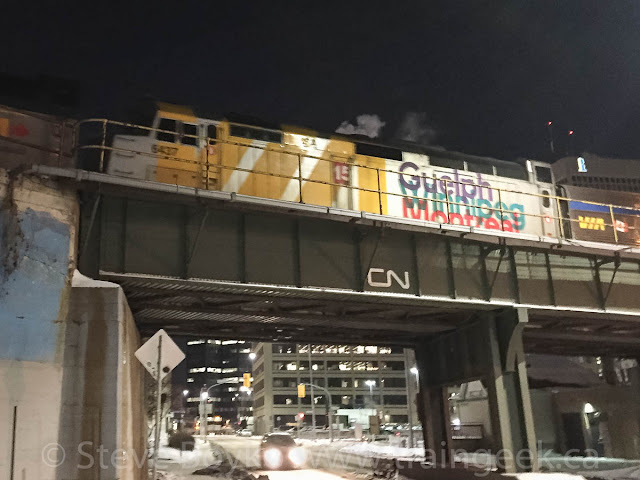 VIA 6454 still has its full "CANADA 150" wrap. They sat there for a long time... or at least what seemed like a long time. 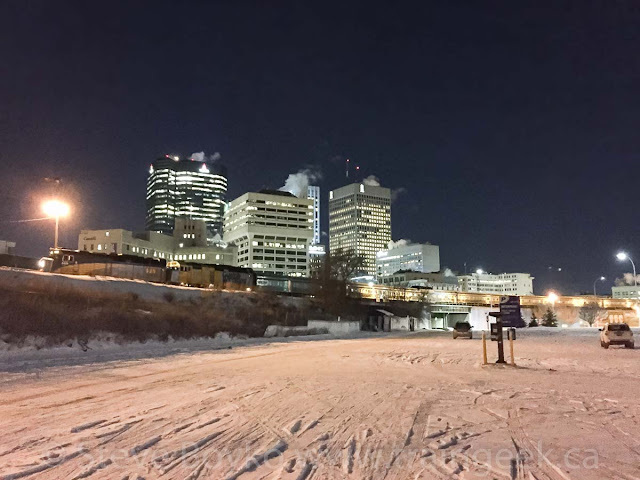 It was pretty cold outside (-22C or -8F) and my fingers and toes were feeling it as I waited for them to couple up. After 15 minutes, I decided to give up and find some warmth. As I walked under the overpass I spotted VIA 1 rounding the bend by the Shaw baseball park by the Red River. They paused before the overpass over William Stephenson Way (named after the famous spy who was one inspiration for James Bond, born in Winnipeg). I ran down to photograph them there. In the photo below, notice the signals at the extreme left of the photo. That's probably why they stopped there. They started to head into the station tracks as VIA 1's two locomotives finally backed toward their train. 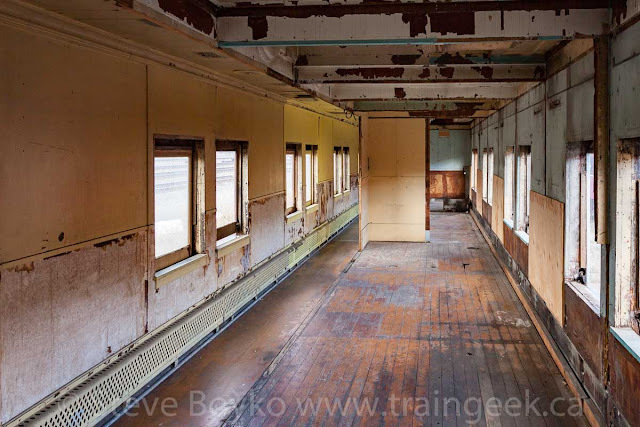 Maybe they lingered there for the crew to help line the switches? 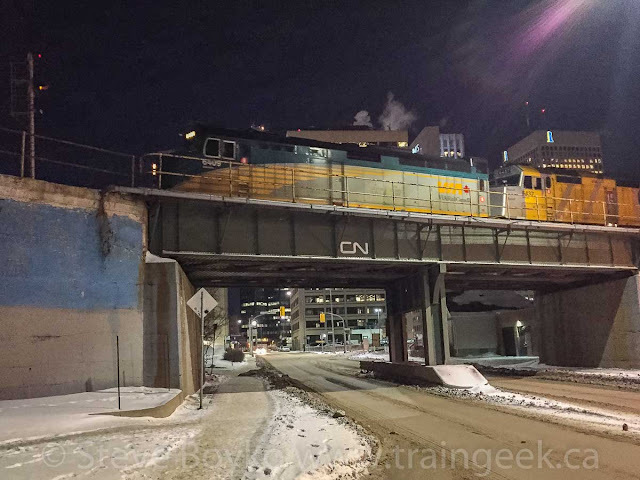 I walked under the York Avenue overpass to photograph them from the north side of the tracks. I wanted to get the two trains meeting, with the Museum of Human Rights behind as the background.. that would have been magic. Yes, it sure would have. Too bad my phone's battery died in the cold. I'll just have to tell you what happened. 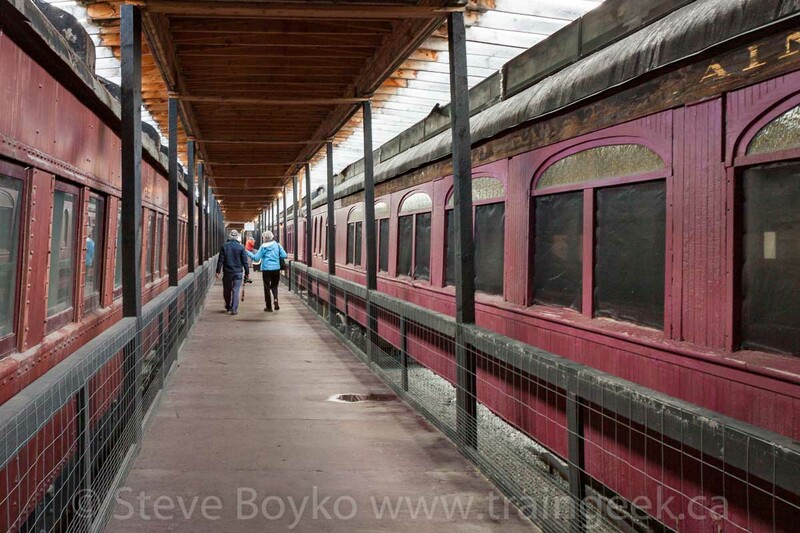 VIA 2's locomotives backed onto the baggage car until it bumped, but they didn't couple. VIA 1 pulled up to overlap VIA 2's locomotives slightly, and one of the crew dismounted to line a switch to go into the station one track north of VIA 2. It looked like a very tight squeeze to me, down on the road below, but I'm sure there was more clearance between the two trains than I saw. Regardless, VIA 1 pulled into the station very gingerly. No scraping noises! I had had enough of the cold and headed inside to warm my extremities and charge my phone. 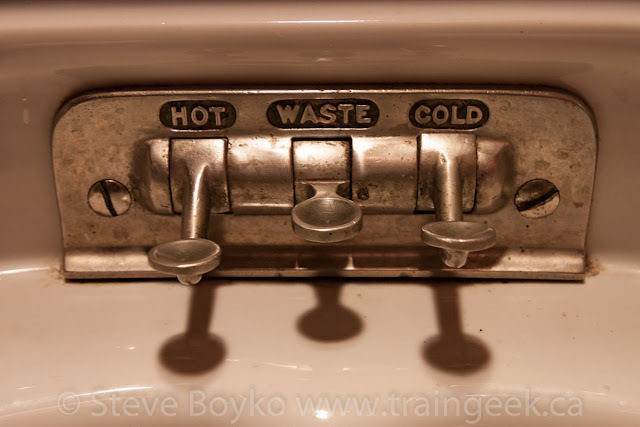 As I walked away, I heard a "ding, ding, ding" of an engine bell. 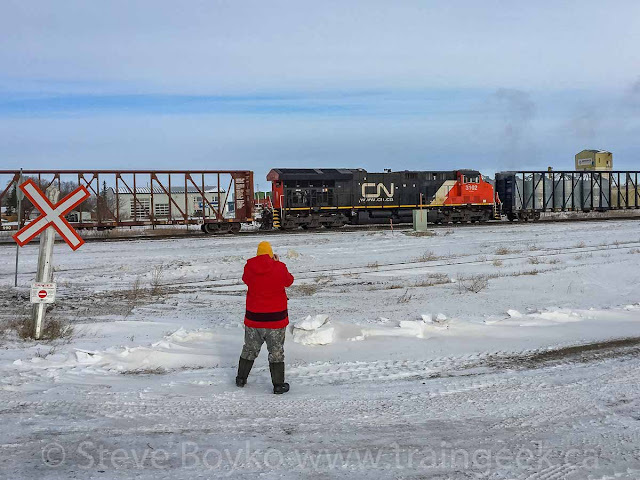 I turned and saw CCGX 4206 and CEMR 4002 - of the Central Manitoba Railway - running light to the east, exercising their running rights over CN as they returned to their yard in North Transcona. VIA 2 left shortly after 7 PM, apparently as soon as they could after VIA 1 got in. Once my phone's battery charged up over 50%, I went over to photograph VIA 1 at the station. That was it for me. I left the downtown at 8 PM and I saw on VIA's tracking site that VIA 1 left at 9:30 PM, only 9.5 hours late... so far. I hope VIA can find a way to get the Canadian closer to schedule. 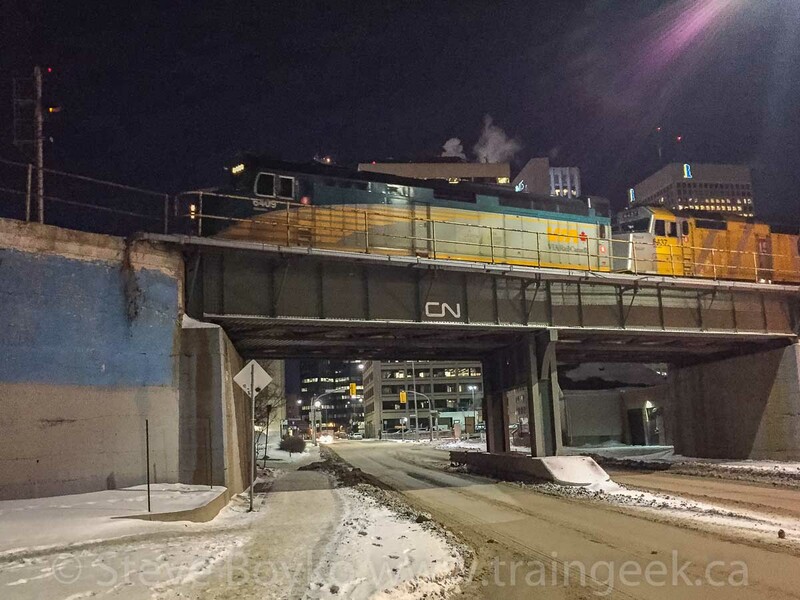 The cold is not helping but I think it's CN's congestion that is really hurting VIA. I'm not sure what the short term solution for that is. 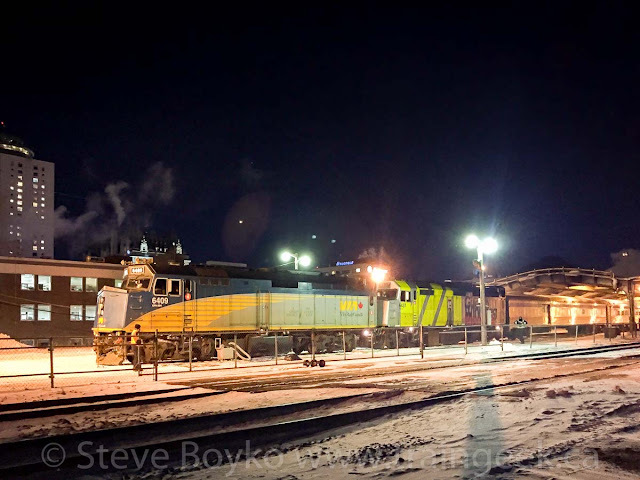 I wish I had managed to photograph the two trains at the Winnipeg station together - a very rare occurrence - but at least I saw it. I've wanted to read Dan Soucoup's Railways of New Brunswick for some time now. As you may know, I lived in New Brunswick for many years and had a deep interest in the railroads of the province. For many years, the most authoritative book on the topic was the book (with the same name, Railways of New Brunswick) by David Nason. 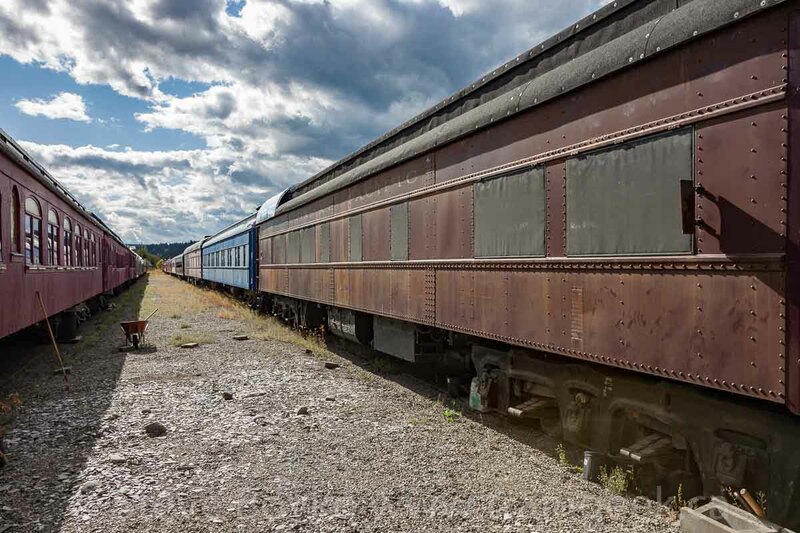 I was looking forward to another perspective on New Brunswick's rich railway history. 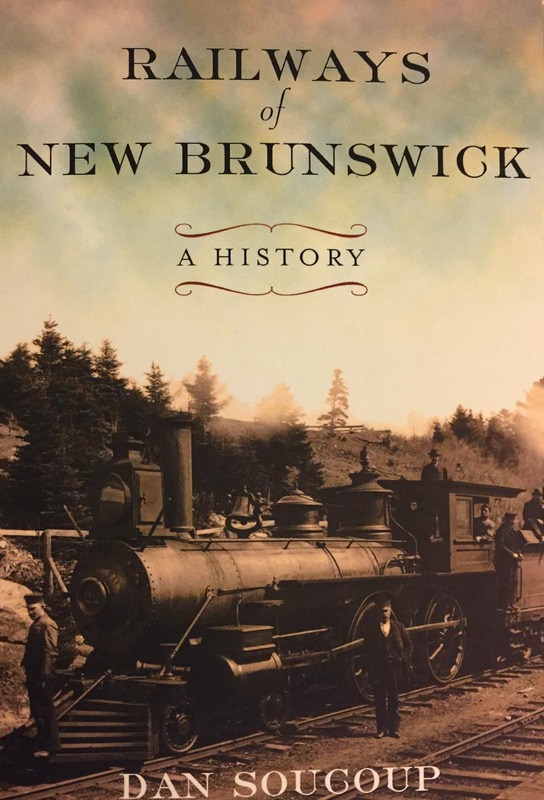 This book starts with a brief overview of the history of railways in New Brunswick, followed by a capsule summary of the major railways that existed prior to the great mergers into CN and CP and subsequent abandonments. The majority of the book features a series of historic photos, each with about a page of text either explaining the photo or inspired by the photo. 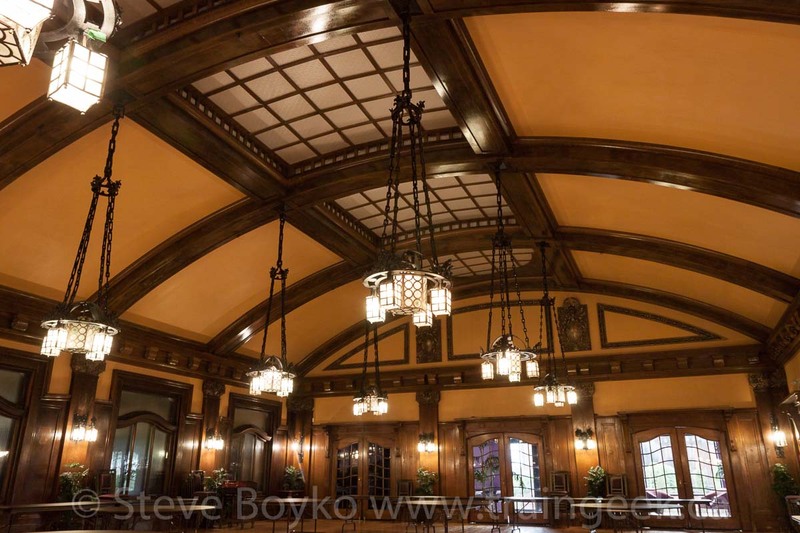 An example would be page 44, with a photo of the Intercolonial Railway station in Moncton around 1900. The text below it talks about the design and construction of the station. 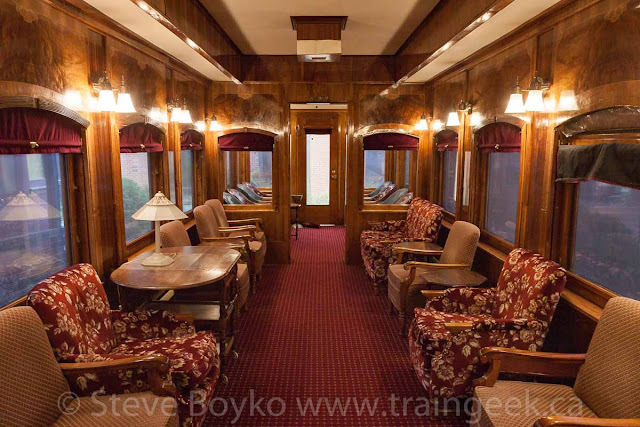 Some of the photos are familiar to students of New Brunswick railway history, as most of the photos came from the Provincial Archives. 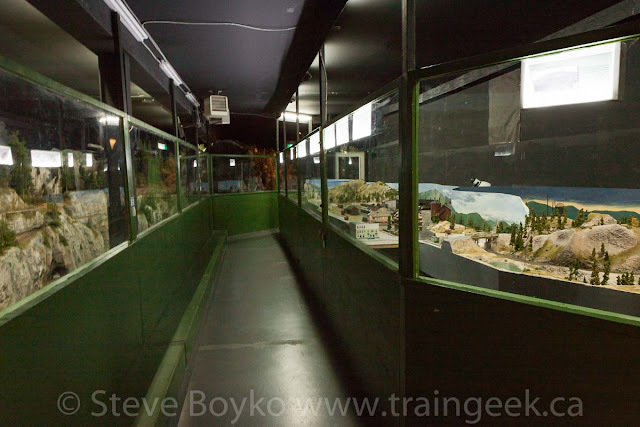 For example, the photo at left (not from Soucoup's book, his reproduction is better) is an often-reproduced photo of a priest at the Bathurst train station. The text under the photo in Soucoup's book talks about the criminal William Gagnier and a gunfight among the railway cars in the yard in 1914. The book is a good read but I wouldn't call it a scholarly work. The list of sources in the back shows a list of town history books like Historic St. Andrews by Ronald Rees, the excellent Cinders and Saltwater by Shirley Woods, and even Railways of New Brunswick by David Nason. So this book is built on secondary sources, which is fine for reading but it's not an academic history book. I was very frustrated by the number of typographical errors in the book. This book needed an editor. There aren't any misspelled words; I'm sure it passed the spell checker but there are a lot of errors. A few examples might help illustrate this. On page 163 the author talks about the end of the Valley Railway due to the opening of the Mactaquac Dam in 1867.. it was opened in 1967. More egregious were sentences like this: "it wasn't so much that Nova Scotia won but that Britain got its' way" and a passage that meant to say "under siege" but read "under seize". Maybe most people wouldn't notice these, but my proofreader's eye picked quite a few out. This book would have benefited from more maps. There is one historical map at the start of the book but there aren't any others. A few maps showing the major railways like the Intercolonial Railway and the New Brunswick Railway would have been beneficial. I enjoyed reading this book for the most part. It's an easy read and the pictures are quite varied and interesting, with good illustrative text under them. 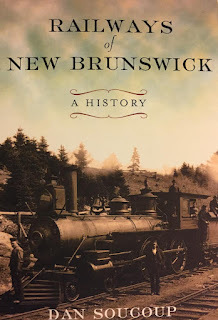 The typos in the book were a distraction, but in general I would recommend this book as a good introduction to New Brunswick's great railway history. I went to a funeral recently and it really started me thinking about things. The funeral was for the mother of one of my wife’s coworkers. She died from cancer, within a matter of weeks after receiving the diagnosis. It was quite unexpected and sudden and really caught the family by surprise. The funeral was lovely and there were a lot of people there. I found it very moving, and I’m not ashamed to say that I cried at several points, even though I had never met the woman. It was clear that she had made a huge impact on a lot of people due to her personality, her service to the neighbourhood she lived in, and her generosity and love of everyone around her. I couldn’t help but reflect on the funeral of my own father back in 2006. His death was pretty sudden, too. I was amazed by how many people came to his reception and to his funeral. I knew he was a good man, but I didn’t know how many people he had affected. Just last week, a friend of mine, Vanessa, died suddenly at the age of 51. I hadn't seen her in many years but she was a shining light, a community activist and just an all around nice person. I think the common thread between the two funeral services, and the three people above, was service. Service to the community, service to the ones you love, and service to the world in general. These people gave of themselves to others, and people noticed and appreciated them. While reflecting on that, I had to think about the service that I give to others. I invite you to do the same. What have you done for others recently? I like to think I give a lot to my family, trying to be a good father and a good husband, but I’m really talking about a wider service than that. What will your legacy be? Are you happy with that? I'm not sure I am... yet. There's work to be done. Just something on my mind. Thanks for indulging me. I'll get back to trains soon. 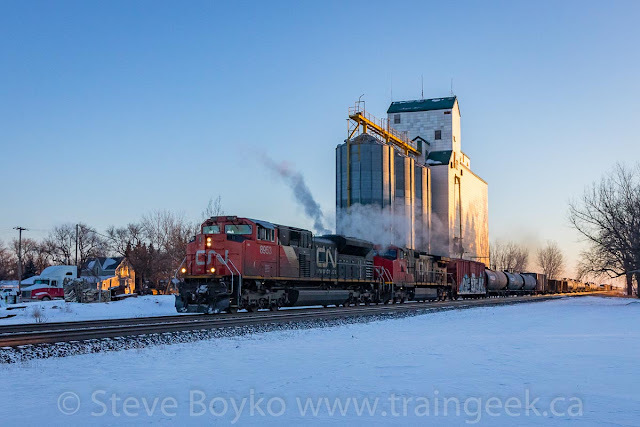 My friend Jason Paul Sailer was in Winnipeg over the Christmas 2017 break and was interested in seeing some trains and grain elevators. 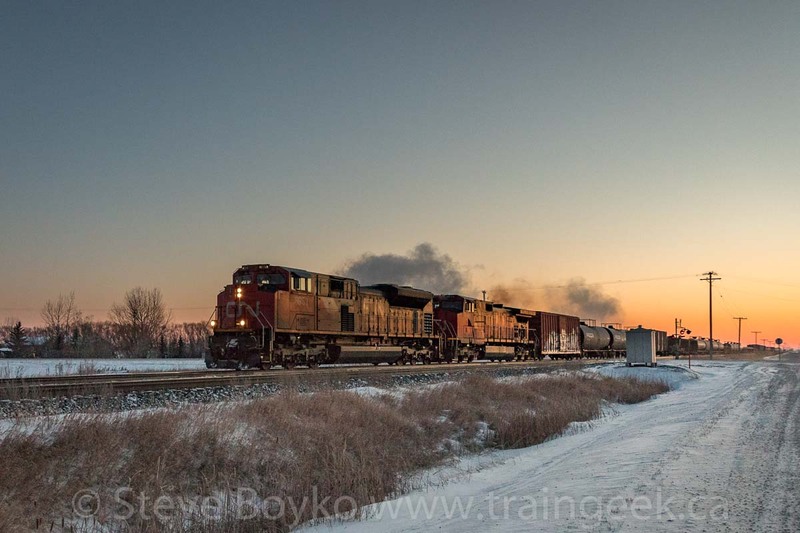 We agreed that we would head west of Winnipeg on December 27 along the CN Rivers subdivision, and see a few elevators along the way. It was super cold around Christmas, and as you can see from the photo of my car below, still cold at 7:18 AM on the 27th. That's -31C without the wind chill! I picked Jason up, and after a quick stop at Tim's, we hit the road. As we approached the Rivers sub, we saw a westbound train, so I headed to Diamond to catch it just east of the diamond itself. Here's Jason giving the crew a wave while taking a photo. The lead photo was taken right after this, as the train approached the signals. We hopped in the car and chased west, getting ahead of them one more time to take this photo. The train had CN 8953 and CN 2594 on the head end. After the train passed, we drove to the Trans-Canada Highway and carried on westward. 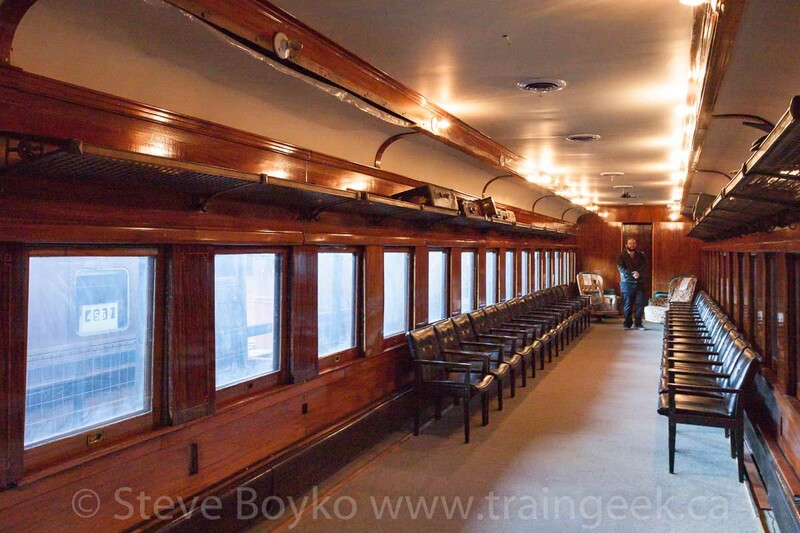 For our first elevator, we decided to catch the train again at the Oakville grain elevator. We parked west of the elevator and walked in a bit to get the elevator with the train passing. We hopped back in the car and, once the train cleared the crossing, we continued west. I should mention what I was doing to protect my camera. 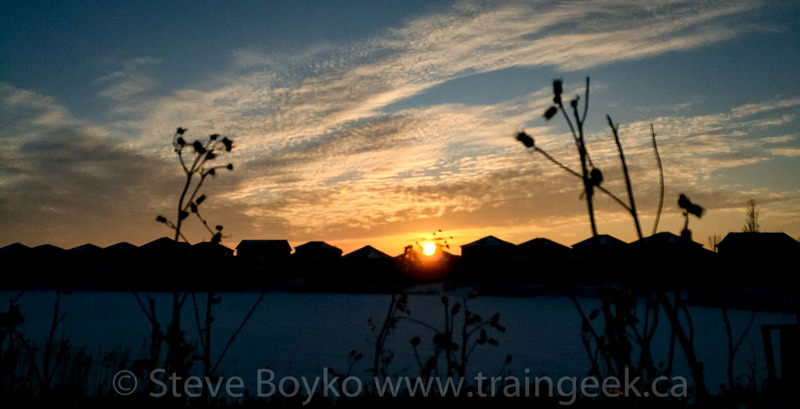 You have to be careful when taking your camera equipment from a warm car to a cold environment and back again. At best you will fog up the lens, and at worst you can get condensation inside the camera, which can cause corrosion. I brought my small camera bag along with me (together with my AmazonBasics bag for the rest of the gear), and when I went out to shoot, I put the small bag on the trunk of the car, open. Once I finished shooting, I put the camera in the bag, zipped it up, and put the bag in the car. This kept the camera in the cold environment and allowed it to warm up slowly. We pulled into Portage and checked out the rail action downtown... zip. There was a CP ECO unit in the yard, idling, but nothing else was happening on the CP side. 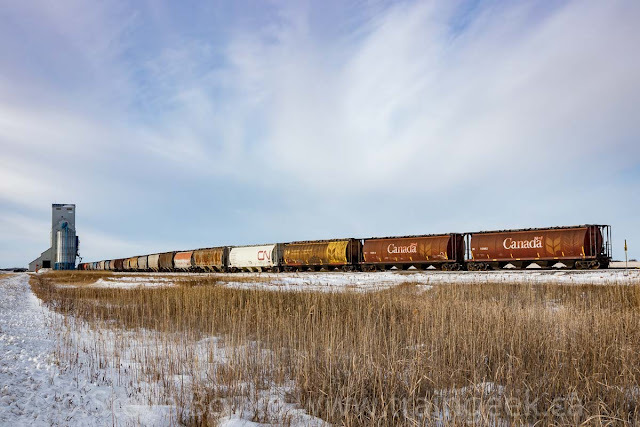 On the CN side, there was a green signal facing east, meaning a westbound was coming. We set up by the CN station, and the train passed by in a rush. What? 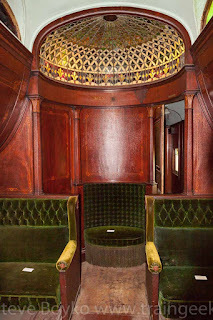 The same train AGAIN? Dang it! 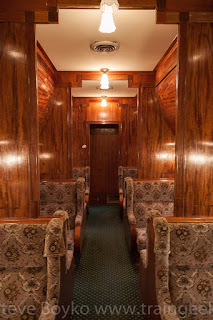 The same train! 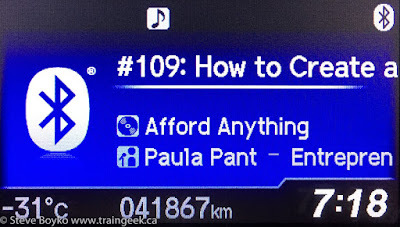 I was sure that CN 8953 had passed through Portage before we got there, but.. nope. I'm sure the crew were as sick of seeing us as we were of seeing them. We made a quick stop in Austin to photograph the grain elevator there. There still wasn't any action on CP, which is not surprising these days, sadly. We dropped into the bustling town of Carberry to see the Archer Daniels Midland (ADM) operation there. The ADM plant is just south of town and features a large loop track, and the facility has its own GP10 locomotive for pushing the grain cars through the plant. I have been to Carberry a few times but the locomotive was always parked by the building. This time it was actually working, pushing a string of cars through the large blue building seen above. I assume the rail cars are loaded inside that building. We watched it for a minute or two, but it was pretty cold outside and we had places to be. Onward! Jason had been to Oberon and Brookdale before, but he missed photographing the unique grain warehouse in Brookdale, and he had never seen the Mentmore elevator, so... up highway 5 we went. We had to stop in Oberon to see my favourite grain elevator. I just love this old, worn elevator with its weathered wooden sides. It's a "must see" in my opinion. I've posted about the Oberon grain elevator several times, so I won't post any more photos... this time. We made sure to photograph that grain warehouse well this time! I had photographed it before but it was nicely lit by the morning sun this day. 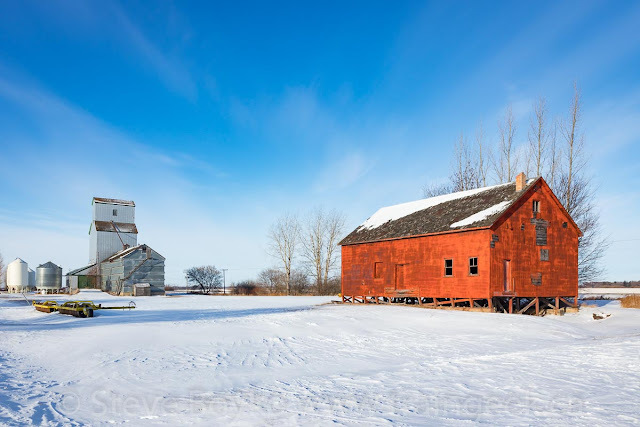 This is probably the only remaining grain warehouse in Manitoba. 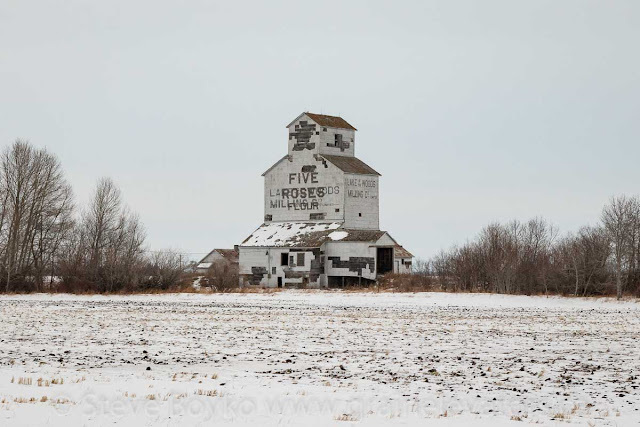 They were common before the advent of grain elevators, but were rendered obsolete by the elevator since they saved the manual effort of shoveling grain from the warehouse into the grain boxcars. 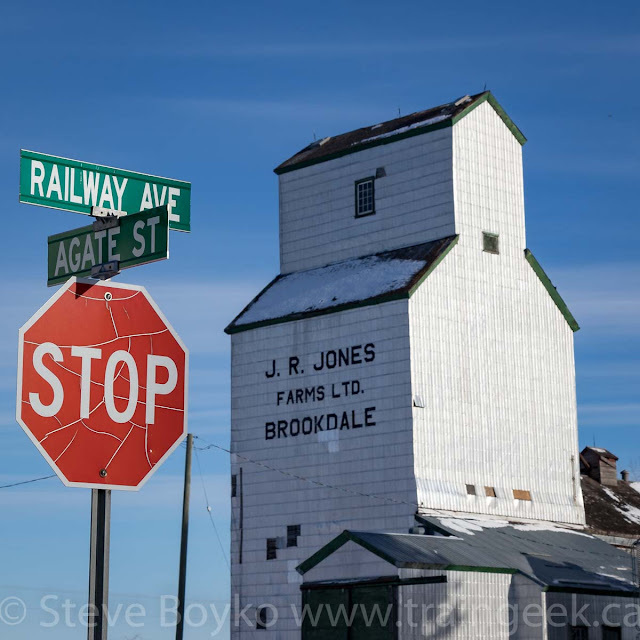 After photographing the warehouse, we tried a few angles on the Brookdale grain elevator itself, just for fun. Jason had told me there was a railway station just outside town. 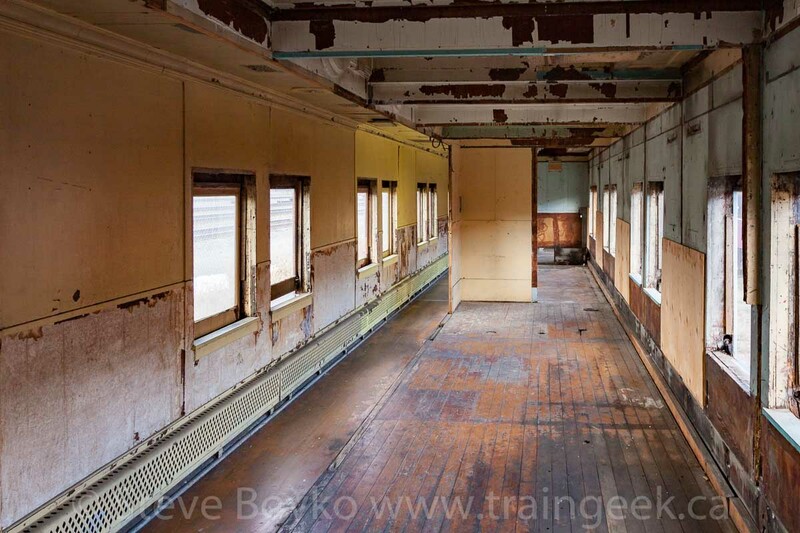 When I was last in Mentmore I kept an eye out for a train station, but didn't see anything. It turns out I didn't look far enough. 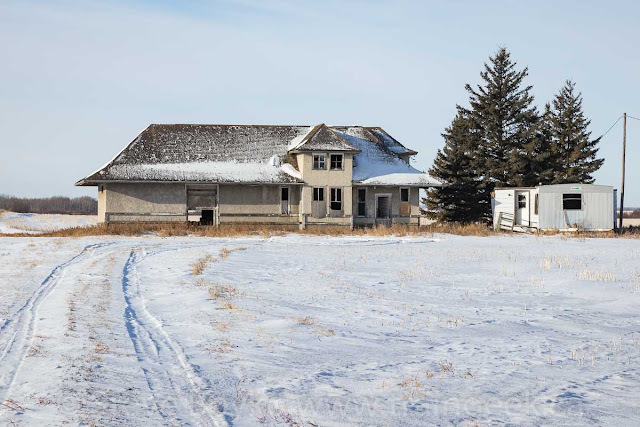 Jason told me this is the former Ingelow, Manitoba train station, moved here to a site just southwest of Brookdale. It looks quite abandoned and is on a property with some other abandoned-looking buildings. We took a few photos from the road and carried on to Mentmore. 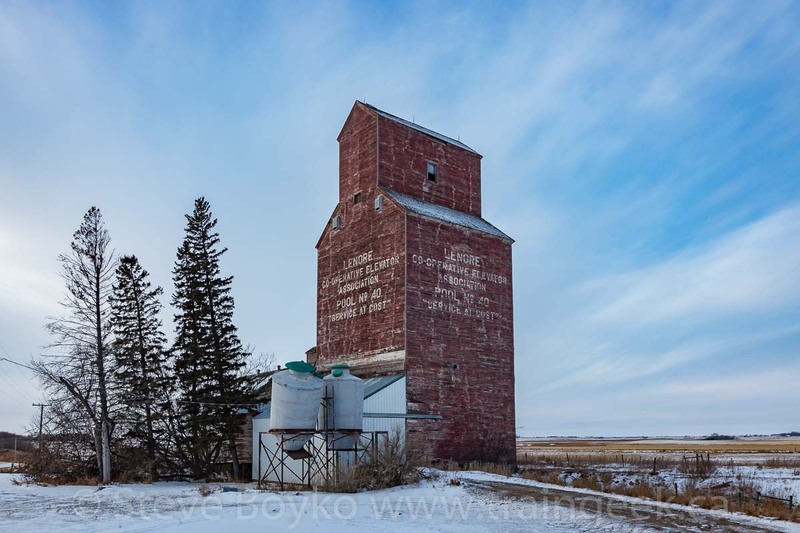 The Mentmore grain elevator is another favourite. It's not far north of Brookdale so it's an easy place to visit. 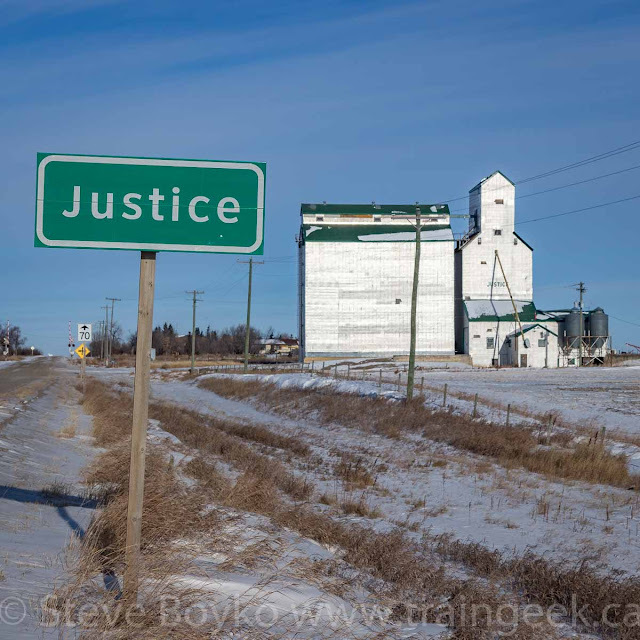 We took some photos from the road from various angles, then went back south to the main road and carried on to Justice. It was nice to revisit Justice. I had been there in August 2014 on a wee grain elevator trip but not since. The elevator hasn't changed at all. 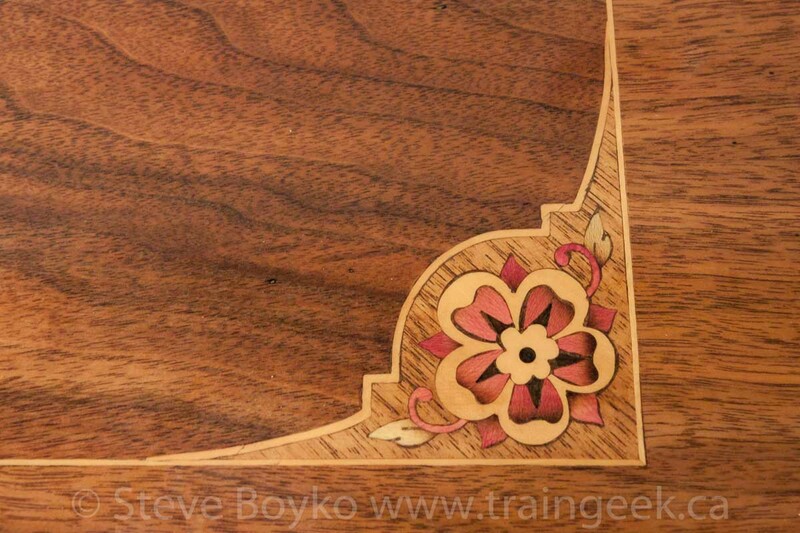 The photo above is a new angle for me. 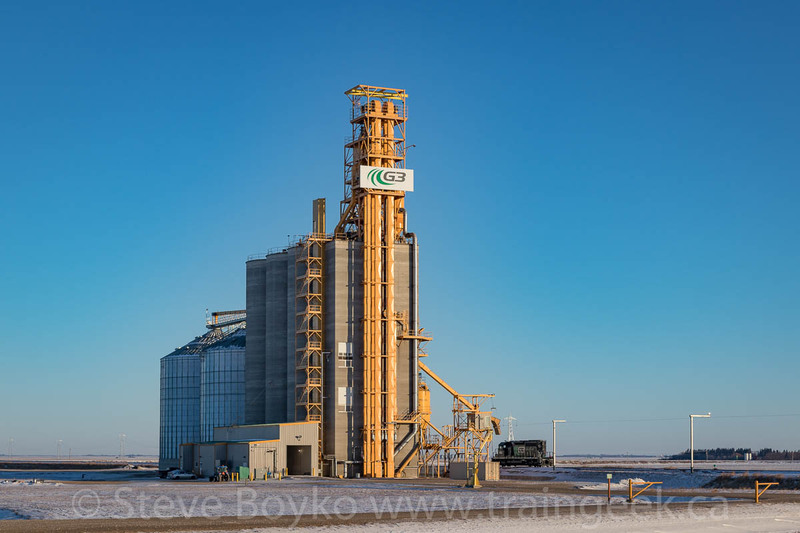 This elevator is well known as it is the last photo in Greg McDonnell's book Wheat Kings. 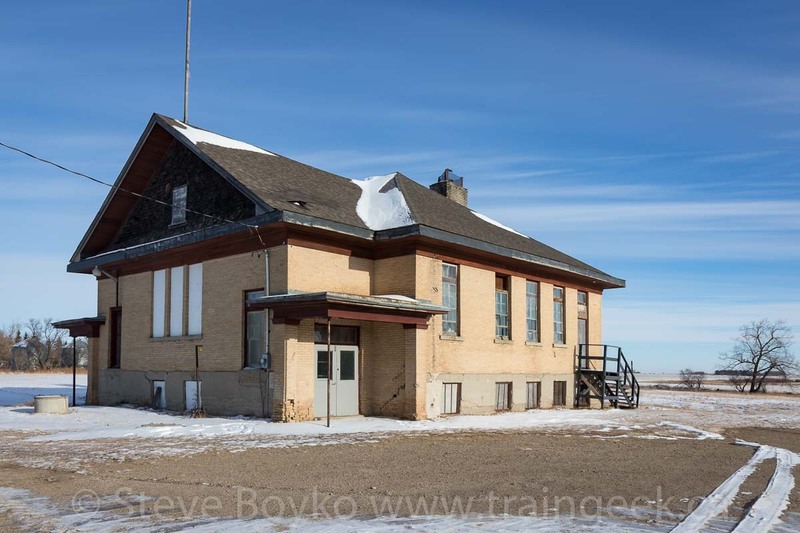 We wandered around the town a bit, something I didn't do before, and we discovered the old school. 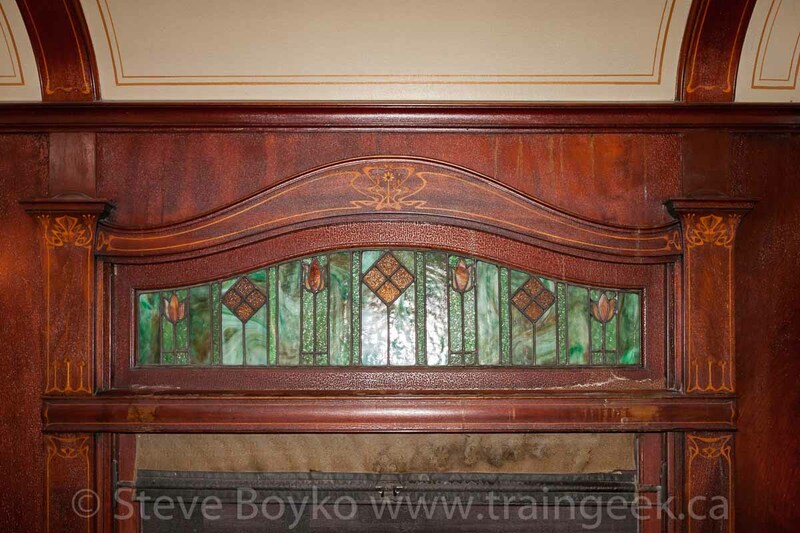 There is a stone inset into the building just to the left of the main door that said it was built in 1912. It closed in June 1967. I'm not sure if it is still used for anything but it still has power and looks to be in decent shape. 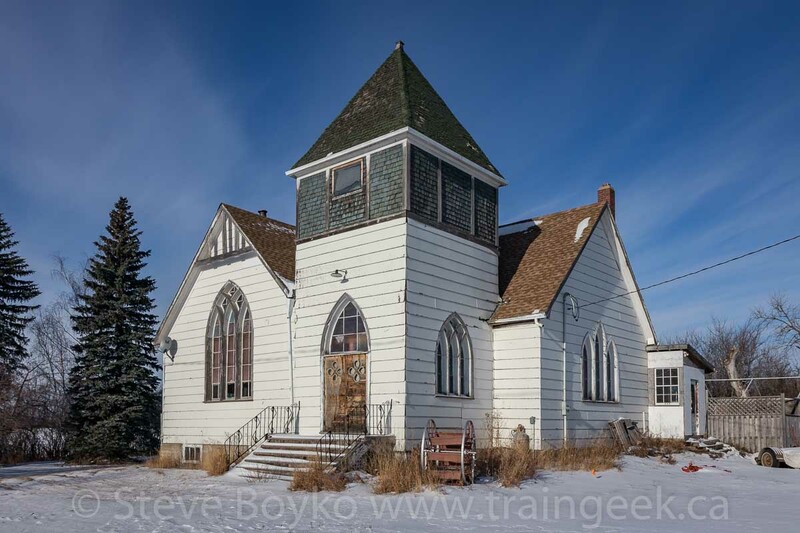 There's also a church in town, built in 1910 as a Methodist church. It became a United Church when the Methodist, Congregational Union, 2/3 of the Presbyterians and the Association of Local Union Churches all merged in 1925. This church held its last service on August 11, 2002. So that was Justice... on to Forrest. 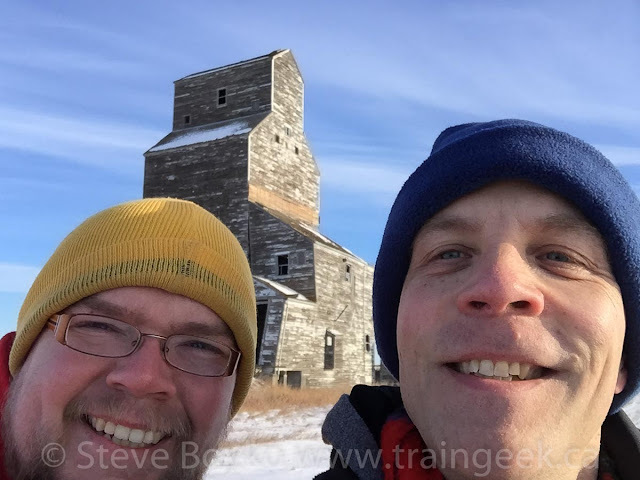 We didn't stay long at the Forrest grain elevator. Jason took some photos and I looked for a different angle. I've been at the Forrest elevator a few times so I wanted something different. I'm impressed by how well the lettering stands out on the annex. 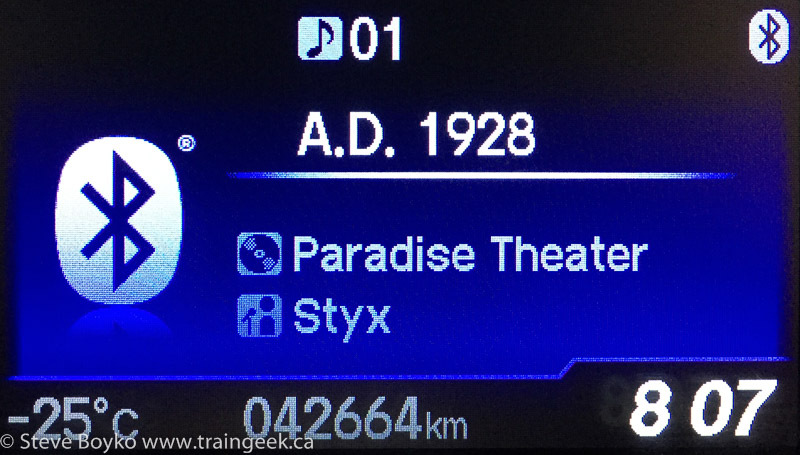 We checked the time and decided where to go next. Jason was interested in seeing Bradwardine's grain elevator, so that meant we had to go through Rivers. After a quick stop at McDonald's in Brandon, we headed up highway 10 and turned west onto highway 25. As we drove west, I saw an eastbound train south of us on the CN Rivers subdivision. Nothing to be done about that! Nearing Rivers, we spotted a westbound train going the same direction we were. It was clear we would arrive in Rivers just before the train, so I told Jason to bail out as soon as I stopped to get the shot, and I would follow. We took the crossing on the east side of town and I screeched to a halt as the crossing lights started. I wasn't able to get the head end, but Jason did. Here he is photographing the mid-train DPU, CN 3102. 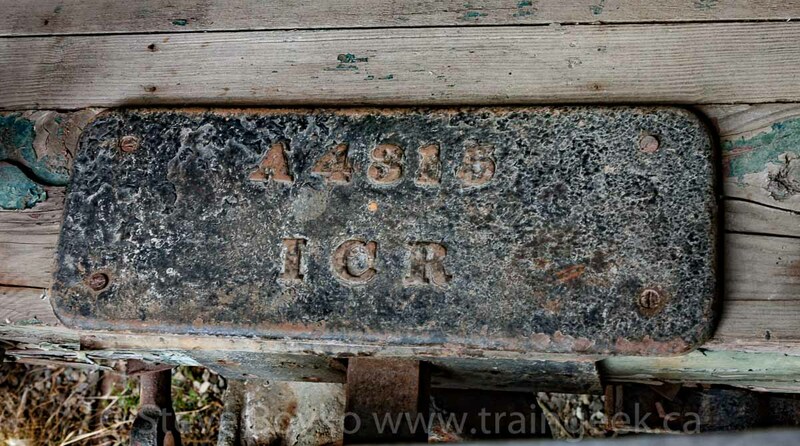 The train was CN 347, recognizable by all the empty centerbeam flat cars. You may recall I photographed CN 347 back in June 2017 near Rivers. After the train passed, we went over to the old station and took a few photos. 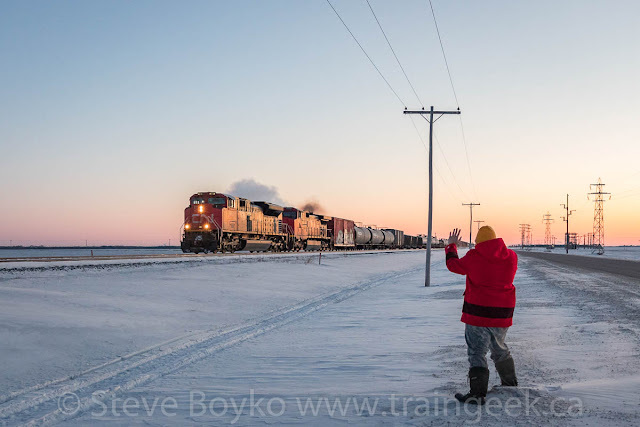 Two CN crew came out of the bunkhouse, said hi to us, and waited near the tracks. 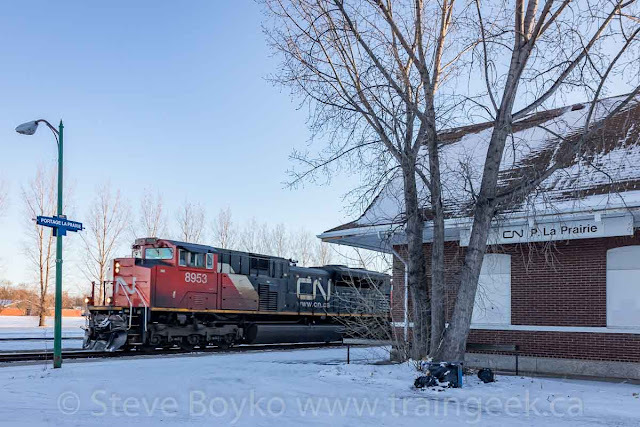 It was clear they were doing a crew change, and soon enough CN 8895 came rolling up to stop by the VIA shack. Seven or eight minutes later, the train was under way again. I elected to shoot video, with my camera on a monopod. 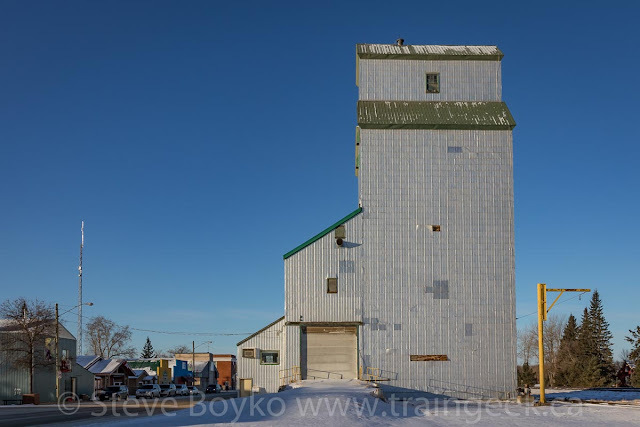 I took one quick snap of the ex Cargill grain elevator in Rivers but it's not worth posting. We headed past the old air base (CFB Rivers) toward Bradwardine. I knew the Norman grain elevator wasn't far away, so we took a few minutes to take that in. 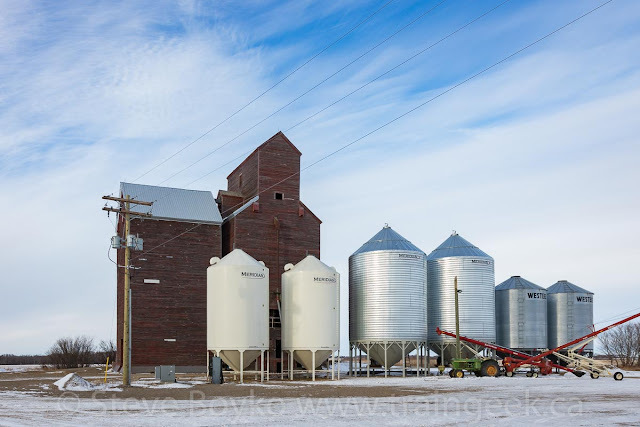 The Norman grain elevator is owned by Canada Malting and is very much a going concern. There were several trucks parked there and I could hear machinery working. The town of Bradwardine is pretty much a ghost town by this point, but the Bradwardine grain elevator is still in operation. There are plenty of abandoned houses and businesses in the town. I thought I read somewhere that this elevator is for sale. I did a little Googling and couldn't find anything, so maybe I am mistaken. We took a few shots and continued on to nearby Lenore. 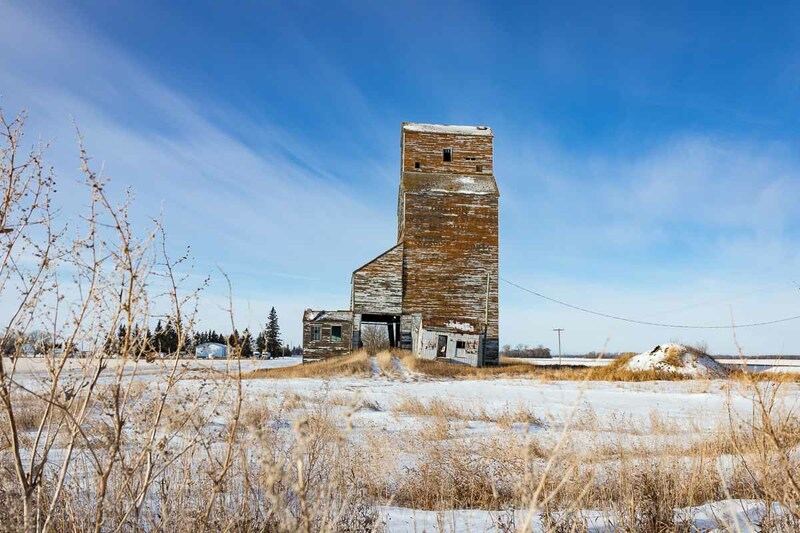 Both Bradwardine and Lenore were on the ill-fated CP Lenore subdivision, and are the only two grain elevators remaining from that rail line. 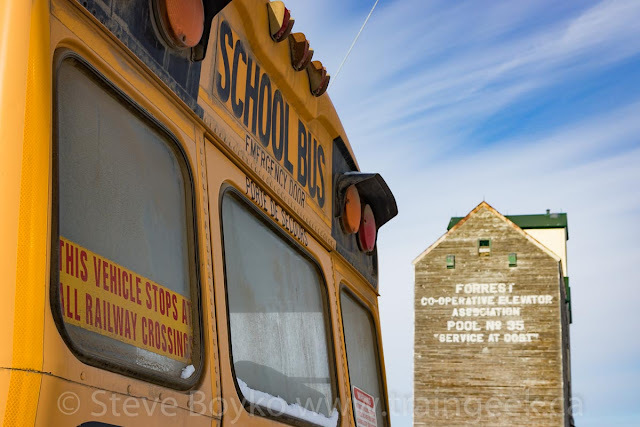 The Lenore grain elevator may or may not be in operation. The driveway looks pretty new, but one ramp of the driveway is blocked by trees, so it's not clear what use if any the elevator is being put to. 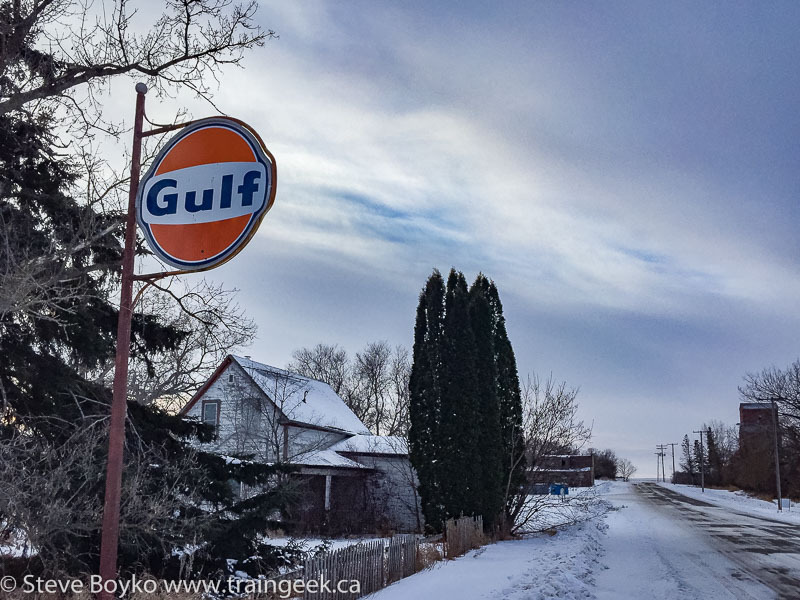 I do like the old Gulf sign that still stands in Lenore, long after the gas station itself disappeared. Our final elevator was the lovely old ex Lake of the Woods elevator in Harmsworth. To reach it, we had to zig zag across the back roads. 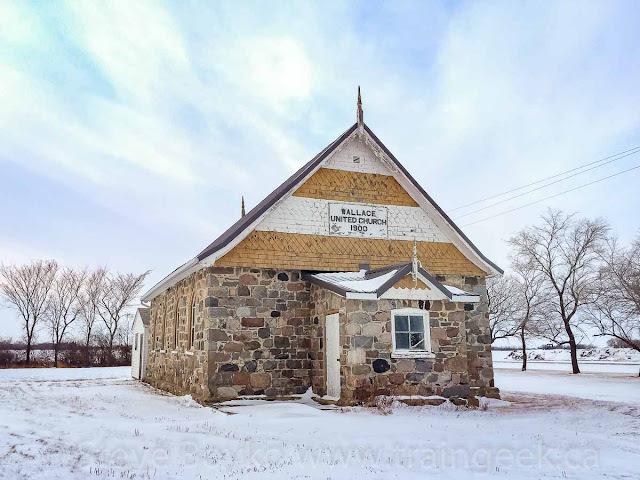 We had been on several gravel roads already, and they were fine to drive on as they were frozen solid and only had a bit of snow. We stumbled across this lovely old stone church as we were zig-zagging. This is the Wallace United Church, built in 1900. 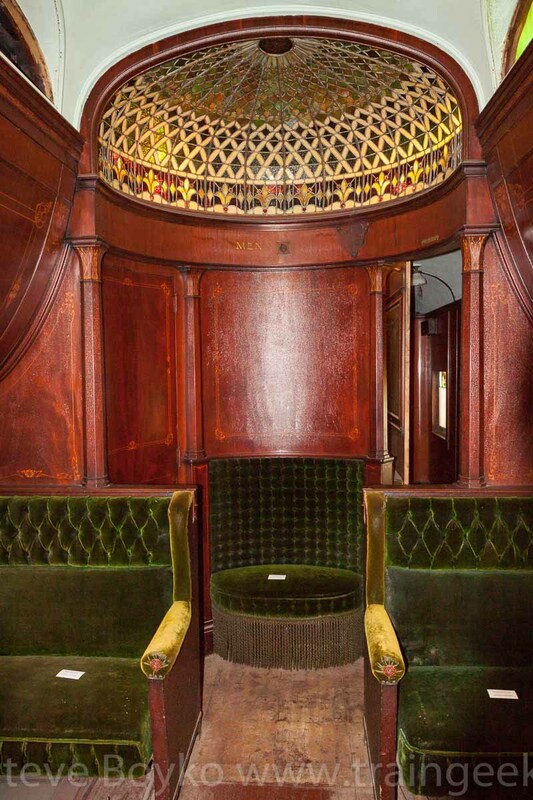 It looks to be in remarkably good condition. The Harmsworth grain elevator is a lovely old Lake of the Woods elevator, built in 1910. When I was last here in April 2016, I spoke with the owner and he thought it might be the second oldest grain elevator in Manitoba, after Elva. The elevator at Cameron is about the same vintage as this one, or maybe a year or two older. Regardless, it's old! As we zig-zagged out of there toward Virden and the Trans-Canada Highway, we stumbled across this old, collapsed house and granary. We admired them from afar in the failing light, and continued on to the highway. It was dark by then, so we hit the TCH for home. After a long drive - and a quick pit stop at Tim Hortons - we arrived in Winnipeg. I dropped Jason off and headed home. Not bad - 14 grain elevators, 3 trains and 797 km driven in 12 hours and 49 minutes. Thanks, Jason, for the good company as we traveled around! It was fun. PS if you're on Twitter, you can follow @PrairieSentinel for grain elevator photos!